Belakangan beredar “Terjemahan pidato Mark Zuckerberg di China – Menjawab pertanyaan mengapa saya memperisteri seorang wanita berparas tidak cantik?” yang beberapa kali sliweran di Timeline saya (selengkapnya dibawah). Saya tidak bisa menemukan sumbernya, karena memang tidak disertakan, dan setelah googling tidak ada hasil yang bisa menunjukkan sumber yang katanya “Terjemahan Pidato Mark Zuckerberg di China”. [EDIT: maap typo, “Zuckerberg” bukan “Zuckerberk”]. Mod: (Speaking in English) Now let’s introduce the founder of Facebook, Mark Zuckerberg. 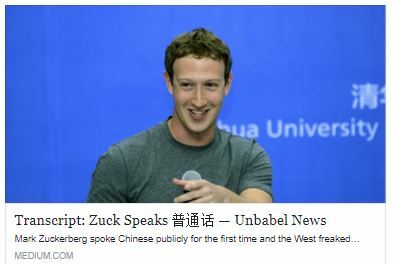 Zuck: (Speaking in Chinese) Hi everyone, thanks for having me. I’m happy to be in Beijing. I love it here. My Chinese is terrible, but today I want to try using Chinese. I might need to practice. Host: Mark, everyone’s shocked you can speak Chinese. Why did you want to study Chinese? Zuck: [Because] It’s fun. There are three reasons: the sec-, the first, my wife is Chinese. Her second language is Chinese, but her grandma only speaks Chinese. I wanted to speak with her (the grandma). One day last year, my wife and I decided to get married, so I told her grandma [the news] in Chinese. She was REALLY surprised. H: Priscilla is your wife. MZ: (English) Alright! Yeah… (Chinese) Second, I think, isn’t it… I want to study Chinese culture. China’s a great country. I think that studying the language helps me study the culture so I think I should study the language. The third [reason] is Chinese is hard. I only speak English, but I like challenges! H: So, everyone, how about tonight we give Mark a challenge: I’ll go ahead and use Chinese. How many times have you been to China? MZ: Four times. I’ve been to Beijing, Shanghai, Hangzhou, and Tianjin. MZ: (English) Yeah. (Chinese) While we are in Beijing, I want to ride the high-speed rail. I also want to see the Huo Yuan Jia (霍元甲 or “Fearless,” the Jet Li movie) statue. I like this movie so I want to see its statue. H: Mark’s a big Huo Yuan Jia fan so of course he’ll go to see its hometown’s statue. So what city’s your favorite? MZ: They’re all the same. Uh…I might like Beijing the best because it’s got a lot of history. H: So what’s your plan for this trip to China? MZ: Um…I didn’t hear you. H: (Emphasizing pronunciation) What’s your plan for this trip to China? Z: (English) Yeah…(Chinese) This week, I will take part in the Tsinghua University Economics and Management Committee meeting. I came to join the Committee meeting. I think Tsinghua’s students are great. Facebook has more than 140 Tsinghua friends. (To moderator) You’re one! MZ: Next year, we’ll be in China recruiting the best engineers. Right, just last month we recruited 20 Chinese students. H: Yes. Last month, we had 20 students [recruited]. Next year, they’ll work at Facebook. (To Mark) So what about you? Why do you want to participate in Tsinghua’s Economics and Management Committee? MZ: First, I want to thank Dean Qian. (English) Umm. yeah and… (Chinese) I’m very flattered to join the committee. I really care about education. In America, I’ve done a to support education. I hope to join this Committee because it’s a good opportunity to let me study [Chinese] and support Chinese education. H: Very good, Mark. It’s great seeing that Mark would like to support Chinese education. This month you’ve also been to other great countries. What’s the purpose of this trip? MZ: Yeah…um..I’ve been to India, Indonesia, South Korea, and Japan. We wanted to see how help the people use the internet. Today, most of the world — about 65%, about 500 million people — don’t have access to the internet. Some people — about 15% — don’t have a network. Some people, about 30%, don’t have the money to pay for the internet. But most people who don’t have internet don’t have it because they don’t know why they’d want to use it. If I were to ask you, if you didn’t have a computer, cell phone, or the internet, and I asked you if you wanted to use the internet, you might ask me why I’d want to use the internet in the first place. So there are a lot of problems. But we need to stay connect with the world. The internet creates work, opportunities, and economic development. It’s really important. H: Mark is very serious about connecting the world. When did you start wanting to connect the world? MZ: In 2004, I founded the first version of Facebook because I wanted to connect all of the students at Harvard. I’ve always thought that there should be a product that connects the world but I thought that other companies were making this. I remember when I was in college and I’d go out with friends to eat pizza and talk about the future, (English) you know… (Chinese) One day after I founded the first version, I told my friend “I’m happy to connect students, but some day there will be a product to connect the world.” But we were only students. I thought another company — I thought that Google, Microsoft — other companies had more than 10 thousand engineers and a trillion **corrects self** 100 million, users. and we’re only students! But we always believed that global media is extremely important. Other companies didn’t believe this, and we did, so we built this [company] and now we have 1.3 billion users. H: So in the past decade, Mark’s built up a fantastic company. There are a lot of students here who also want to found companies. What kind of advice do you have for them? MZ: Umm…to start a company? Yeah. Umm…I think that the best companies aren’t started because the founders want to start a company but because they want to change the world. If you decide you want to found a company, you might or develop — (English) sorry — (Chinese) you need to develop the initial idea. [For example], you might [want to] recruit a lot of workers (a recruiting company). But you might have a lot of ideas and you don’t know which one is best. And if your initial idea is bad, then your company will be bad too. But if you decide to change the world, you’ll need to come up with more ideas, and if any of them are fantastic, then you start a company. H: Great advice. First develop a good idea, then found a company. So with regards to when you decided to establish Facebook, in the hard times, what kind of tips do you have? MZ: The best thing is you can’t give up. Developing a company is really hard. Most things don’t just happen in passing. You’ll need to make really hard decisions. You’ll need to fire some employees. H: You aren’t saying you’re going to fire me tomorrow, are you? MZ: **Laughs, shakes head** These are all difficult. If you don’t believe in your mission, giving up is easy. Most founders give up, but the best founders don’t. So believing in your mission and not giving up is the most important. H: Well, it can be said that you are one of the most successful founders out there. What are your thoughts on Chinese innovation? MZ: (English) Yeah, I mean…(Chinese) I think Chinese has a many of the world’s most innovative companies. Last night, I ate dinner with Xiaomi’s (CEO) Lei Jun. Is that right? H: (English) Yes, yes, yes, yes. MZ: Xiaomi is an extremely innovative company. They develop different products very quickly. They (their products) are very cheap. I think they’re, Xiaomi, will grow very quickly. Tencent’s Weixin is also very big. Most Chinese people use Weixin or QQ. Taobao is also very innovative. Taobao creates work opportunities. I believe that China has many of the world’s most innovative companies. H: So Mark has very positive opinions towards Chinese innovation. Speaking of China, I’m going to ask Mark a difficult question which may be impolite. I hope I won’t get fired tomorrow. So what is Facebook’s plan for China? MZ: Yeah, that. (English) So um…(Chinese) In China, I also see a developing economy. We’re very impressed. (English) Yeah…it’s…it’s amazing. MZ: So we want to help other places in the world connect to China. For example, big cities, countries, parks…(English) Yeah, I mean, so…(Chinese) Hangzhou and Qingdao also have great pages on Facebook. We cooperate with these cities to develop their pages and share Chinese culture. H: [In answering] such a difficult question, Mark only said one sentence. Give him a short applause. **crowd applauses** So after a difficult question, let’s lighten up a bit. We’ll ask Mark some personal questions, some easier questions, about the details of his life. **As if speaking to a child** We’re going to ask you some questions about your life, okay? H: The first question is: what kind of colors do you like? MZ: Blue. I can’t answer red or green because Facebook is blue. H: **Mentions something about the backdrop being Facebook blue** What Chinese food (i.e. dishes) do you like? MZ: Hmm…When I’m in Beijing, I’m always eating snacks from the Hutongs. MZ: But I also like Beijing duck. H: (Laughing) You like Beijing so much that you like Hutong snacks and Beijing duck. Outside of work, what kind of activities do you do? MZ: I don’t have any time outside of work. MZ: On Sundays, Priscilla and I cook dinner. H: If I remember correctly, you also have a pet. MZ: Yeah, we also have a dog. His name’s Beast. He’s a sheepdog. He’s super cute. I love him. H: Mark, your dog also has a facebook page. MZ: Yeah, I made Beast’s facebook page. Beast has 2,000,000 fans. H: Between you and Priscilla, whose Chinese is better? H: Thank you so much Mark. We still have a few minutes left. Next, let’s invite a few students to ask some questions. Dean Qian, come handle this. Dean Qian: (English) So this is an occassion where Americans speak Chinese and Chinese speak American. We only have very limited time for a couple questions. So let’s see…where’s the microphone? (To student) Yes? Student 1: (Chinese) Should I use English or Chinese? Chinese? S1: When Facebook was first developing, how did it distinguish itself from competing social networks? MZ: Uhh…? You asked me why I…? S1: (English) Umm..Let me use English. Dean Qian: We’ll ask Tsinghua’s President later. MZ: But now I can’t go back. The first, your first question, the biggest challenge. Our biggest challenge might have been in 2004, we needed to change Facebook into a company. One day, in 2012, we were growing very slowly, our revenue was growing very slowly, and everyone was unhappy. But we changed Facebook into a company, and now we have 1 billion users who use Facebook on their mobile phones. MZ: Umm…this year, Facebook is 10 years old. H: (Clarifying Zuck’s pronunciation) 4 years? 10 years? Facebook is 10 years old. MZ: **Looking confused** Okay, alright. So I’m asked, in the next ten years, what will we try to develop? I’ve decided that we’ll develop three things. One, we’re going to connect the entire world. So we need to help everyone to use the internet, this internet.org. Two, we want to make (English) artificial intelligence. (Chinese) I don’t know how to say that [in Chinese]. MZ: I think that 10 years from now, computers will be better at seeing, speaking, listening, languages. So we’re developing this. Three, once everyone is using cell phones, I believe the next platform is “Virtual Reality.” I also don’t know how to say this. Occulus is the first product, but we hope to make many products. Saya, Mark Zuckerberg dari Facebook, saya adalah orang yang diberitakan sebagai seorang anak muda kaya raya yang tidak punya berita gosip, seseorang yang sangat mencintai istri, dan si Mark yang mempunyai tampang muka bayi, hari ini saya ingin menggunakan waktu beberapa menit untuk ngobrol dengan teman-teman di China. Tidak sedikit teman chinese yang menyampaikan kecurigaan mereka, terutama dua pertanyaan tersebut. Pertama, mengapa saya memperisteri seorang wanita tidak berparas cantik? Ke-dua, Mengapa saya menyumbangkan saham facebook saya sebesar US$45 milliar, apakah untuk menghindari pajak? Teman-teman saya menganjurkan saya tidak perlu menjawab pertanyaan-pertanyaan yang beredar. Bill Gates, Shakira dan teman-teman saya berpendapat tidak perlu menjawab pertanyaan-pertanyaan tersebut. Tapi saya putuskan menjawab dua pertanyaan kalian. Sekaligus menjawab lebih banyak pertanyaan kalian, misalnya, mengapa saya tidak membeli mobil mewah, dan juga mengapa selalu hanya memakai T-shirt yang sama. Pertama-tama saya ingin membahas, apa itu wanita cantik, apa itu wanita tidak cantik.. Saya mempunyai banyak kesempatan bertemu berbagai wanita cantik, namun apa yang disebut wanita cantik kebanyakan berhati seperti kaca, jika sakit manjanya seperti seorang putri raja, dan penyakit angkuh, dan juga akan bertanya kepada saya mengapa begitu kaya namun tidak mau berganti mobil. Saya tahu tujuan mereka adalah mau pamer dilingkungan teman. Wanita demikian walaupun secantik apapun, bila hatinya hanya menuntut, tetap kelihatan jelek, jiwanya juga kotor. Wanita demikian barulah dikatakan sebagai wanita berparas jelek, diberikan gratispun saya tidak mau. Kecantikan diluar akan berkurang nilainya seiring bertambahnya usia, namun kecantikan dari dalam akan bertambah nilainya seiring bertambahnya usia. Dalam hal ini para ahli ekonomi di wall street pasti mengerti, makanya saya sama dengan mereka, tidak akan bersentuhan dengan benda yang secara cepat turun nilainya. Raut wajah seorang wanita adalah cermin hati seseorang, senyumnya selalu memukau. Sejak hamil, Priscilla sama sekali mengabaikan perobahan yang terjadi pada raut mukanya akibat kehamilannya, tetap berpakaian sederhana, tanpa dandan, namun kebahagiaannya saya rasakan sepenuhnya dan juga nampak kepada orang lain. Saya mencintai kesederhanaan Priscilla. Saya mencintai penampilannya; bersemangat namun bijak, berani namun penuh kasih, berjiwa pemimpin namun juga bisa mendukung orang lain. Saya mencintai keseluruhannya, saat bersamanya, saya merasa sangat nyaman dan relaks. Saya sama sekali tidak merasa Priscilla bersanjung kepada saya, selain memiliki kecerdasan intelektual yang tinggi, dia juga memiliki kecerdasan emosi yang tinggi, jangan lupa bahwa Priscilla adalah lulusan jurusan kedokteran Harvard University, anda bisa coba tes masuk universitas tersebut; jurusan hukum, kedokteran, ekonomi adalah jurusan yang menjadi rebutan orang, walaupun lulus tes masuk belum tentu anda bisa lulus penuh, kalau mau dikatakan bersanjung, lebih tepat saya yang bersanjung kepada Priscilla bukan sebaliknya. Perkawinan ibarat sepasang sepatu, hanya yang memakainya tahu sepatunya nyaman dipake gak, Priscilla paling cocok buat saya, saya dan Priscilla adalah pasangan yang paling ideal di bumi ini, saya berkenalan dengan Priscilla saat antrian toilet, di mata Priscilla, saya adalah seorang kutu buku. Ini adalah jodoh. Saya tidak bisa menahan diri memamerkan foto saya dengan Priscilla yang begitu berbahagia. Tips bagi kalian: sebagian wanita hanya melihat keburukan orang lain, tidak melihat kecantikan orang lain, dengan demikian, kebahagian akan meninggalkan kalian, tidak berjodoh. Sebab, apa yang ada dalam hati itulah yang ada dalam kenyataan. Sekarang membahas tentang penghindaran pajak yang dituduhkan kepada saya. Kalian berpikir, saya menyumbang US$45 milliar apa untuk pamer kekayaan atau menghindari pajak. Apa otak kalian atau otak saya yang bermasalah? Apa yang kami sumbangkan US$45 milliar berbentuk saham sebetulnya bukan nilai sebenarnya, tapi hanya nilai pasar, bisa lebih tinggi atau lebih rendah nilainya, ini tergantung pasar yang menentukan. Seiring perkembangan teknologi yang maju pesat, kami sungguh berharap 100 tahun mendatang, hampir semua penyakit dapat dicegah dan diobati. Saat ini, kebanyakan manusia meninggal akibat penyakit jantung, kanker, stroke, dan penyakit menular lainnya. Diharapkan berbagai penyakit tersebut dapat teratasi dengan lebih cepat. Saat menyadari anak kami dan banyak anak lainnya berkemungkinan bisa menghindari berbagai penyakit, kita semua punya tanggung jawab untuk mewujudkan impian tersebut. Saya tegaskan sekali lagi, saya dan isteri saya akan berkontribusi semaksimal mungkin untuk tujuan tersebut. Di Silicon Valley, ” Mengubah Dunia ” kata tersebut bukan hanya sebuah slogan, ia merupakan sebuah keyakinan dan kekuatan. Mimpi kami berharap melalui usaha keras kami untuk memperbaiki kualitas pendidikan, pengobatan, integrasi dunia untuk disumbangkan kembali ke masyarakat, mengubah dunia, membangun suatu dunia yang lebih baik untuk semua umat manusia. Teman-teman sekalian, kami sedang melakukan upaya “Change The World”, apa yang telah kalian lakukan? Saya mendengar diantara kalian banyak mengeluh, saya ingin katakan bahwa tidak ada artinya mengeluh, tindakanlah yang lebih bermakna. Saya dan Priscilla menyumbangkan 99% saham kami di facebook, mendekati semua saham milik kami, apa kalian masih menganggap yang kami lakukan untuk menghindari pajak? Apa masih ada maknanya menghindari pajak? Banyak teman-teman di China yang kaya raya, mengapa mereka tidak ikut menyumbangkan 99% harta mereka untuk menghindari pajak? Betul, sepanjang tahun saya memakai T shirt berwarna abu dan mobil yang sangat sederhana. Saya tegaskan, saya bukan orang yang berhari-hari idak ganti baju, namun saya membeli banyak T-shirt berwarna abu-abu, saya berusaha menjalani hidup ini sesederhana mungkin, supaya menghemat pikiran dan waktu memutuskan berbagai hal yang tidak penting, sebab memilih memakai pakaian, makan pagi, dan berbagai hal kecil tersebut menyita cukup banyak waktu dan pikiran, saya tidak ingin membuang waktu hanya untuk hal-hal kecil tersebur, sehingga saya bisa lebih konsentrasi melakukan berbagai hal yang lebih bermanfaat untuk masyarakat. Saya memiliki 3 buah mobil, satu Toyota seharga US$16 ribu, VW golf seharga US$18 ribu dan Chevrolet TSX seharga US$30 ribu. Setelah facebook go public, saya ganti VW GTI seharga US$30 ribu. Saya berpendapat, mobil hanya sebuah alat transportasi, tidak perlu yang mahal-mahal. Saya tidak memakai berbagai barang bermerek yang penting saya merasa nyaman, mengapa butuh barang-barang yang berlebihan? Kalau yang menyangkut kebutuhan berlebihan justru otak, perasaan sendiri lebih butuh diutamakan. Apa yang ada dalam hati itulah yang ada di dunia kenyataan, percayalah bahwa dunia ini adalah alam semesta yang indah, jika anda tidak percaya, anda tidak akan bisa memiliki dunia yang indah, tidak akan memiliki kehidupan yang indah dan penuh kedamaian. Hal diatas merupakan keyakinan saya dan Priscilla. Akhir kata, bila ada yang tidak berkenan, mohon petunjuk! Anda bisa tinggalkan pesan untuk saya. Terima kasih telah meluangkan waktu mendengar yang saya sampaikan.